Structurae is the online online database of international scope that covers the entire range of activity of bridge, civil and structural engineers. Engineers from around the world use Structurae to obtain information on bridges, tunnels, dams, skyscrapers, stadiums and many other types of structures. The database offers not only general information but also detailed technical data and numerous images for the individual structures—making Structurae a unique research and working tool for civil and structural engineers. Nicolas Janberg, chief editor and owner of Structurae, created the database in 1998 after obtaining his masters degree in civil engineering from Princeton University in order to promote publicly the work that civil engineers do for society. Evers since the database has continuously grown in size and scope, and increased in depth and breadth of information. Many practicing engineers have contributed to the site, as well as engineering and architecture offices and many other companies active in the construction sector and that want to show their own work on Structurae. Structurae offers advertising spaces and content marketing options for small and larger budgets. With company profiles, product descriptions and case studies (application reports) Structurae offers your company a reknown platform uniquely suited for Content Marketing for the construction industry. Company profiles always run for a full year (365 days). Share the details of your products right here on Structurae and use the potential of 72.000 reference structures for your products. Product descriptions are only available in combination with a company profile (see above). This ensures that whoever is interested in your product can also find your contact information right on Structurae. Adding more products beyond the number included in your package, you can order additional product descriptions at 50 €/Product. Through a case study (or application report), you can describe in detail how your product was applied on a specific project and which advantages this provided. These kinds of reports are only available in combination with a company profile (see above). This ensures that whoever is interested in your product or services can also find your contact information right on Structurae. Adding more case studies beyond the number included in your package, you can order additional product descriptions at 50 €/Product. Several different banner sizes and positions are available on the entire website. 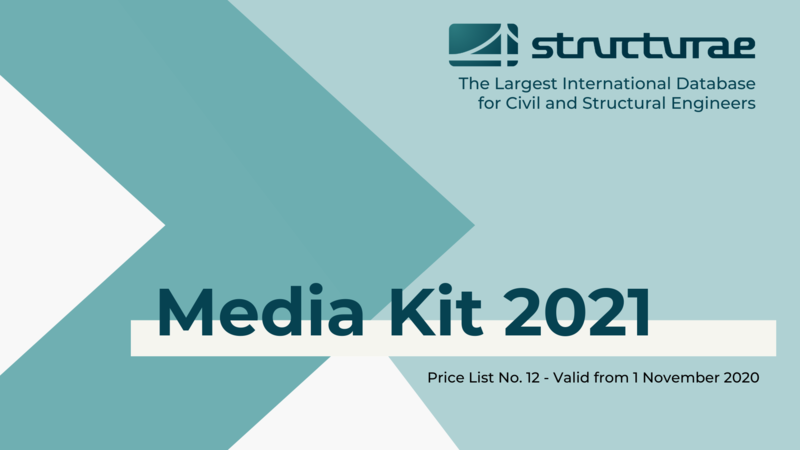 Detailed information is available in the Structurae Media Kit including prices and conditions. Use Structurae to the advantage of your company and advertise your products and services on a platform in addition to your company's own website. This way you can reach potential clients, who may not know you yet, generate leads and increase traffic towards your website. Structurae is also available as media partner for congresses, trade fairs and other events. Please inquire regarding special offers for these. Note: All prices excl. VAT. The current Structurae Media Kit including all individual prices, package offers and sales conditions is available for download as a PDF document!